Terraflops and a big pile ‘o games! I had the pleasure of watching this one on my actual console via the live events app. Much more comfortable. Are you ready for round 2? This seemed like hit after hit of loud music and brand new games, it got a little relentless! No talking, no introduction, we’re straight into a video. It’s a white Xbox! This is a nice throwback to the original 360. It’s 40% Smaller and will be called the Xbox One S. Featuring a remodelled controller with texturized grip and more range. 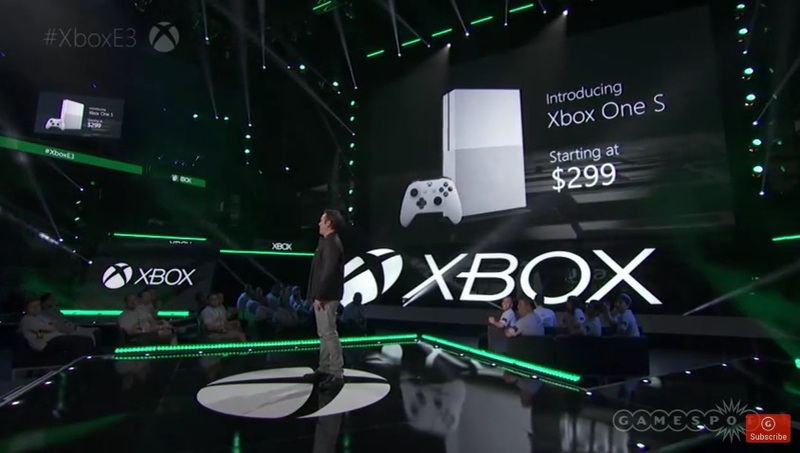 Phil Spencer walks onstage and drops the $299 price point to a great reaction! I like this idea, the original XBO is huge and clunky, and the price point for this new one isn’t extortionate. Rod Ferguson steps upto the plate to talk Gears of War 4, as well as introducing “play anywhere” which allows you to play Xbox One games on your windows 10 PC. This would go on to be a key feature of this press conference, but I’m wondering how many PC’s will actually be able to RUN these games? Anyway, Gears will have crossplay with Windows 10 in all modes including the redesigned Horde Mode. Laura Bailey (she voices one of the characters) shows up for some live co-op play. It’s Gears as we know it, although there are some nice instant kill moves and the weather effects look great. An ageing Marcus Fenix is shown at the end to cheers from the audience and then a special edition Gears of War Elite controller is unveiled. It looks great, but I bet it’ll cost a king’s ransom. Killer Instinct is briefly shown. Did you know there have been 2.5 Million matches played over Xbox Live? no me neither. General Raam from Gears will be a playable character soon. 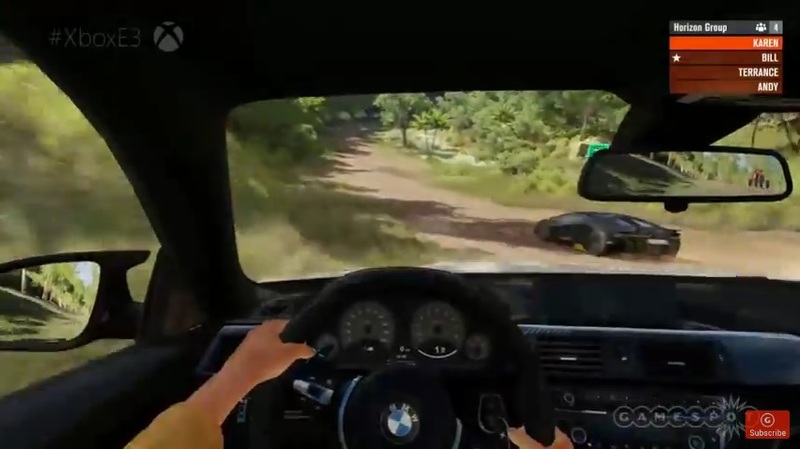 New video (I’m rattling through these because there are loads) Forza Horizon 3. Name isn’t revealed straight away but we see trucks racing round dirt tracks interspersed with Lamborghini’s powering through city streets. All looks gorgeous, but racing games aren’t really my cup of tea. Ralph Fulton from playground games gives us a demo of 4 people playing: 2 on PC’s, one on Xbox One and the 4th guy is on the brand new XBOne S. You can take shortcuts through open spaces/rainforests to get to destinations, so I’m guessing there’s a fair amount of freedom in this game! 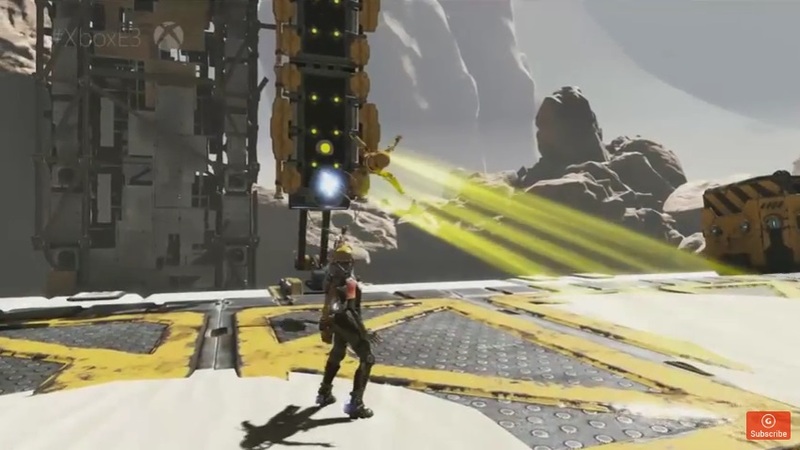 A game called Recore is shown next. Third person action romp with different controllable droids that you can use to solve various puzzles. Looks like fun! Final Fantasy XV is shown next, and two Japanese gents from Square Enix show off a boss battle against a giant monster. They explain that the combat has never been this deep before, but the video is REALLY underwhelming to me and the combat looks like a snooze fest. A lot of dodging followed by quicktime button presses? Eugh. One game I would see later would show the ageing franchise how to do combat properly! Release date was set at 30th September. There was a quick video for an expansion for Tom Clancy’s Dvision, entitled Underground. This has a good vibe to it, the story being that your enemies have retreated underground because you keep shooting at them. Gunplay looks slick in this. Patrick Bach talks Battlefield 1, but I’ve covered this in my EA post already. Mike Ybarra talks Xbox Live next, a few new features are coming this fall. The first gets a big cheer – the ability to play music in the background as you play your game. People loved that feature on 360, so it’s a welcome return. Language choice no matter which country you’re in seems like a no-brainer. And the addition of Microsoft’s Cortana probably won’t help many people but hey, it’ll be there soon. Also coming soon are some social features, clubs for people with the same specific interests as you, “looking for group” to help players find others (like 2 other people to help with a certain mission on Destiny, for example) and Arena mode where you can set up and play tournaments. Minecraft next, and it’s going cross platform with PC, Android, IOS and… VR?! That’s a surprise. Invite friends, build together, it’ll be fun! New texture and character packs will mean you can modify building blocks, and make entire cityscapes if you want. You can also mod characters and enemies anyway you like. I might actually get into Minecraft with all this new stuff! Something really fun next: Xbox controllers can now be customised to be ANY colour you want! Pink and orange? Why not! Sky blue back panel with lime green thumbsticks? You can do that! No price point but they even got me with this. I HATE black, white and grey in the games room! Chris Charla comes out to talk ID@Xbox – the smaller independent games that are introducing us to so many fascinating new experiences (I actually agree with this!) A title called “Inside” headlines this section, but the video we see is so vague I don’t know what it’s about. The rest of the titles are squeezed into a 5 minute video reel, and some of the clips REALLY piqued my interest. A title called “Cuphead” has an art style that reminds me of old cartoons from the 70s/80s. I’ll be on the lookout for these! 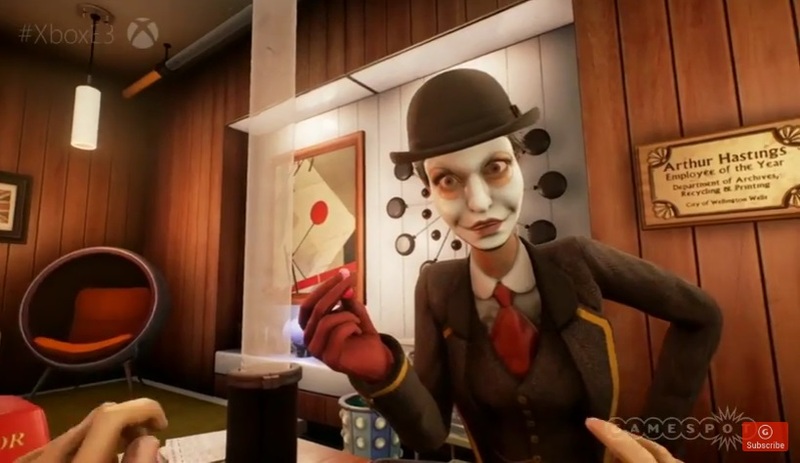 “We Happy Few” from Compulsion games wins my award of “weirdest in show” and the trailer is unsettling, yet attracts me at the same time. Picture a world where everyone wears facepaint and is on happy pills. Anyone who ISN’T on these pills starts to see horrifying things, and is labelled a “downer” as alarm bells ring and the police kick the door down! CD Prokjet Red, creators of Witcher 3 announce that the card game within their game was SO popular they’re turning it into a standalone title! How’s that for fan service? They briefly explain the rules and announce a closed beta in September. Tekken 7 gets a run-out, complete with Akuma from Streetfighter. But again I’m underwhelmed. The game needed a bigger showcase, as the one fight we see is okay, some nice special effects around the stage…. but it’s bland and there’s nothing here that sets the world on fire. Early 2017 for this one. A nice bonus is that Tekken Tag Tournament 2 will be free for everyone! A trailer is shown featuring a VERY familiar face, and makes me very excited. Frank West is tapping away on his Smartphone – DEAD RISING 4 IS HERE! Christmas music plays while Frank slaughters zombies with all manner of silly weapons and vehicles, just as you’d expect. Indoor and outdoor locations are shown, and my face is lit up like a Kid at Christmas. I love this series! Shannon Loftis from MS Studios talks about original games, highlighting past hits like Sunset Overdrive, which immediately gets her into my good books. She introduces Scalebound. And THIS is the game that puts Final Fantasy in it’s place. Again there’s a gigantic monster that takes up the whole screen, but you dont spend 5 minutes dodging it’s giant arms, you plot your attacks between you, your team mates and your pet dragon. Hitting weak spots and turning into some kind of animal form for increased attack power, this is much more like it! Getting towards the end now, bear with me. Sea of Thieves was a nice surprise for me. 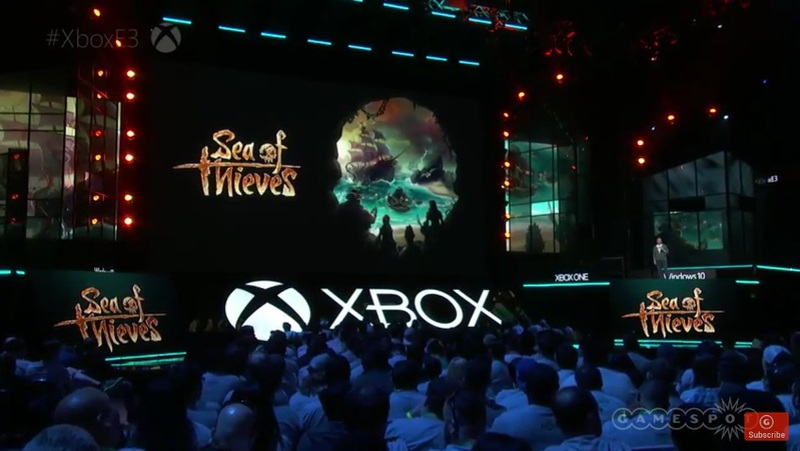 Craig Duncan from Rare introduces the co-op pirate game where you assemble your crew, and sail the open seas. Pirates can row, open sails, keep lookout or just walk the plank! You can drink grog, repair leaks, and I’ll bet you can sing sea shanties too. It just looks like good, co-op fun. There are battles with other ships too, so expect combat. State of Decay 2 has a short trailer, this is a co-op zombie survival game and looks quite nice. Halo Wars 2 is announced with a well-done trailer pitting the brutes against the marines. This isn’t your standard Halo, but a strategy game. To be released in February next year, but a surprise twist: there’s a beta test for the game that’s online RIGHT NOW! I’ve said my piece on this matter before, but as this is the final announcement of a 2 hour long conference it leaves a sour taste in my mouth. Scorpio has a release date for Holiday 2017, meaning the 1st iteration of the Xbox one will have been in people’s hands for four years, at the very most. I hope you enjoyed this post, because my hands are tired from all the typing! Next up: Ubisoft! I’ll post that sometime tomorrow. Posted on June 14, 2016 June 17, 2016 by itsonlyleggyPosted in Feature, ModernTagged E3 2016, Expo. Next Next post: E3 2016: Ubisoft Edition.